Following the departure of the Spanish regime under Franco in 1973, the occupation of the territory in 1975 by the Moroccan and Mauritanian armies dispossessed the Saharawi of their land for a second time. This dispossession has continued since, with the Saharawi fighting and denouncing such an occupation, both within Western Sahara by passive and active resistance (including demonstrations severely repressed by Moroccan occupation forces) and outside the territory, by a war waged until 1991 and since then by negotiation. 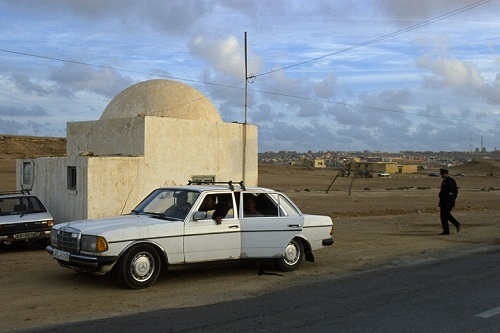 When Mauritania withdrew from the conflict in 1979,the only opponent of the Saharawi remained Morocco, which occupies most of the country (80%) with the help of a defensive military structure, called the Western Sahara Berm, erected from north to south and running for approximately 2,700 kilometres. The Berm is a series of mined sand dunes. The Saharawi people have built the struggle for independence in the refugee camps. Twenty-five years of war and exile have clarified Saharawi identity, which today stands out by language, institutions, morals and culture that are different from those of its neighbours. For 43 years now the Saharawi people have been waiting for the UN to organize the hypothetical referendum to determine the future of Western Sahara in a democratic way. To consider the future of negotiations about Western Sahara, it is necessary to briefly study the status of Western Sahara from the point of view of international law before reviewing the approaches that the UN can use to put an end to the last colony in Africa. ‘Decolonization’ can be defined as the process by which a subordinated territory becomes a sovereign and independent state. For a territory to be successfully decolonized, four essential conditions must be met: a government must be created locally that can act on behalf of the whole population; the colonial power must transfer sovereignty formally and in practice to this government; the local government and the colonial power must agree on the extent of the new national territory; and finally, the new state must receive international recognition and membership of the United Nations. Historically, Spain seized the territory after the 1884–1885 Berlin Conference before withdrawing in 1975, after signing the Madrid Agreementwith Morocco and Mauritania – each stating historical claims, as well as being motivated by the natural resources in the territory. The Madrid Agreement gave Morocco and Mauritania administrative control over Western Sahara. In its 1975 Advisory Opinion on the International Legal Status of Western Sahara, the International Court of Justice (ICJ) came to the conclusion that people of Western Sahara held the right to self-determination. The court rejected the demands for sovereignty made by Morocco and Mauritania over Western Sahara. The judgement was strengthened by the 1975 visiting mission of the UN to (then) Spanish Sahara, which concluded there was an overwhelming consensus among the population in favour of national independence and against integration with any neighbouring state. Since 1975, opposition to the Moroccan and Mauritania presence in Western Sahara has been undertaken by the Polisario Front, which initiated military resistance initially with the help from Libya and then from Algeria. The Polisario obliged Mauritania to withdraw from Western Sahara in 1979, with Mauritania signing an agreement to recognise the Sahawari Arab Democratic Republic (SADR)as the legitimate state of the Western Sahara people. In 1984, the SADR was admitted as a member state of the Organization of African Unity (OAU) and Morocco withdrew from the pan-African organization in protest. Armed struggle between Morocco and the Polisario Front continued through the 1980s. The war was disastrous and ruinous for Morocco, but the struggle stalemated with neither side able to force a victory. In September 1990, Morocco signed a ceasefire, having a desire to conclude the initial peace process swiftly and pre-empt moves to enable a democratic referendum on the ground. Following the ceasefire a UN mission (MINURSO)was established in Western Sahara. Subsequently, the question of Western Sahara has been archived in the annals of decolonization as a non-autonomous territory subject to the principle of self-determination of the right of peoples under colonial rule. To see how this situation developed since 1990, it is necessary to recall the resolutionsof the United Nations. Faced with the failure of any African solution, Morocco and SADR naturally resorted to the United Nations to support a resolution of the dispute. These efforts materialized in the 1990 settlement, enabling the UN mission, a ceasefire and the holding of a referendum giving the option between independence or to maintaining Western Sahara under the sovereignty of the Kingdom of Morocco. The Plan has encountered substantial difficulties in applying its main provisions, starting with identifying which is the eligible body to participate in the referendum process. Despite successive adjustments made to the technical plan, the plan has proved unworkable because Morocco seems to predict that the final result will not be in his favour. Hence, it has worked to block or stymie the UN process by relocating Moroccan citizens from the cities of Morocco to cities in Western Sahara in order to join the UN census without any consideration to the original plan signed with the Polisario. This difficulty has been identified by the Secretary-General of the United Nations and his Personal Envoy. In February 2000, UN Secretary-General Kofi Annan talked openly for the first time about the need for a political solution to resolve the dispute over Western Sahara through direct talks between Morocco and Polisario Front. It is from this moment that the approach of the negotiations as an alternative to the referendum has been installed in the quest of the UN to close the last fief of decolonization in Africa. Why UN is seeking a solution by negotiations and leaving aside the initial agreement? We must not forget that the question of Western Sahara is a pure and simple question of decolonization and in this sense is the object of the application of the principles of international law of decolonization. The principle of self-determination holds that all peoples have the right to freely determine their political status and to pursue economic, social and cultural development. This has been strengthened by the UN Declaration, GA Resolution 1514(1960), which owed much to the decolonisation process, which gathered pace in the 1960s. In this context, self determinationwas closely associated with the right to found an independent state (external self-determination). The question of Western Sahara and its first UN resolution in 1965, which request Spain to withdraw. As with Spain in 1965, the same procedure is applied in the field by Morocco, which ignores the history of decolonization and continues to flout the rule of international law in the matter.This violation of the regional order by Morocco was exacerbated by Spain’s decision, with US complicity, to duck out of its responsibility by secretly concluding the Madrid Agreement with Morocco and Mauritania, which de facto transferred administrative powers over the territory to these two countries. The notion of self-determination is a universal principle, whether viewed through a political, moral, or legal lens as a principle of Jus Cogens.It is with this perspective that the United Nations should seek to find a solution negotiated politically but which respects the right to the self-determination of the Saharawi people. This reflects the problems faced by the practice of negotiations since 2001, which have failed to bring a solution to the question of self-determination. In 2000, the Secretary-General had prepared his conclusions on the impasse that stated the inapplicability of the settlement plan. However, by 2004, the profound differences between the parties on the 2003 Baker IIplan prevented any progress towards a political solution. Morocco rejected the plan and the question of Western Sahara seemingly entered a dead end. Since 2004, the UN Security Council has abstained to make any reference to these plans, dedicating their final burial. Indeed, the Council adopted successive resolutions – 1570 (October 2004), 1598 (April 2005), 1634 (October 2005), 1675 (April 2006) and 1720 (October 2006) – which called on “the parties and the States of the region to continue to cooperate fully with the United Nations to end the current stalemate and move towards a political solution”. It seems that the practice of negotiations in Western Sahara will continue as an alternative to the direct referendum. It seems that the major powers – mainly the USA and France – want to at all costs avoid a defeat for Morocco, which is not in their strategic interests. They want a consensual solution to save Moroccan interests in Western Sahara, which may actually be more in terms of economic interests in favour of Morocco than sovereignty. Since the early 2000s, confusion over the issue has become ingrained, with question of the right to self-determination becoming marginalized by the inaction of the Security Council, according more interest in strategic visions. While there is no threat to international peace and security, the major powers’ attention is elsewhere and this privileges the status quo that works for the benefit of the current interests. The marginalization of the Western Sahara question has become the rule. The initial agreement seems to have be born in “bad childbirth” because the peace agreement was circumscribed under the banner of Chapter VI of the UN Charter without making a point at any time in Chapter VII, in order to respect the clauses of the initial peace agreement. This is the main reason in our opinion that enables the two belligerents to remain in their first position, without offering any concessions to advance the process of self-determination of the Saharawi people. It seems that the UN is taking seriously destabilizing factors in the north-west African region. The UN is attempting to reconcile the international law of self-determination with political considerations, a situation which is difficult in our view. This is illustrated by the time spent in taking different approaches but which have finally ended without a solution. The dilemma of the two approaches – by law or by politics – is present through the two elements opportunity and effectivity. Several factors have contributed to pushing the UN to try new dynamic approaches in Western Sahara. The situation nowadays seems to be different than in the 1990s and early 2000s, with the security of the Sahara and Sahel region (including North Africa) more precarious and threatened by terrorism. The civil war in Libya, the security situation and UN presence in Mali, and threats by the terrorist and jihadist groups are just some examples of this. These factors are separate to the internal environment inherent to Saharawi population, whether refugees or those under Moroccan occupation, who on a day-to-day basis are more threatened by the loss of trust in the UN. The dissatisfaction of western Sahara people, living in poverty and inequality in an existence somewhere between settlers and indigenous people, with marginalization, stolen natural wealth, experiencing a lack of respect for human rights, poor infrastructure in Western Saharan cities compared to Moroccan cities and a lack of services, are determining factors that are pushing the Saharawi youth to seek others ways to live. This includes immigration to Europe – clandestine or official – and working in the illegal economy around Moroccan drugs. In parallel, some can find refuge in the terrorist groups which furrow the Sahel and Sahara. The growth in frustration among the Sahrawi may be a destabilizing factor in the immediate future. The adhesion of Morocco to the African Union in 2017 inaugurated a new era in the relations between Morocco and the African institution and its members, which could lead to a more flexible Moroccan position regarding the self-determination of the Saharawi people. Within the UN, 2017 saw the nomination of the former German president Horst Köhler as special envoy to Western Sahara with the task of seeking a solution by negotiation. The role of mediator varies from one case to the next, ranging from strict neutrality to a role that applies severe pressure. Far from being systematically impartial, the mediator can act as a “communicator”, “enunciator”, or even as a “manipulator”. In the first case, the mediator strives to promote communication and restore trust between the parties. In the second, he does not hesitate to transmit the messages as best as he can: he suggests (as much as possible) formulas for reaching an agreement. In the third case, the mediator goes so far as to modify the ratio of the forces involved by intervening himself in the negotiation. These different forms of intervention can be illustrated by the role played by the American administration in the Camp David or Dayton peace processes. The circumstances and the personality of Köhler could trigger a new dynamic to put an end to this old decolonization conflict, notably given the new support of all Permanent Members of Security Council for the first time in its history concerning the question of Western Sahara. However, clearly the strategies of the protagonists will have a major role in determining whether any new dynamic makes progress. Normally all the treaties must be executed in good faith. The principle of good faith reinforces the pacta suntservanda rule. The parties to a treaty bind themselves to act in good faith because they are bound by the agreement. This is enacted through article 26 of the 1969 Vienna Convention on the Law of Treaties, which specified good faith as the beginning of the discussion of any dispute. But the principle of good faith is also a general principle of law that is binding on States in the absence of any conventional link. States are obliged to behave in good faith in international relations, that is, to comply with “the spirit of loyalty, respect for the law, fidelity to commitments on the part of the one whose action is in question” and refrain from concealment, or any fraud in relations with others. In 2018, the UN Security Council explicitly called for the first time for negotiations without preconditions and for both parties to be responsible for engagement. In Resolution 2414, the UN Security Council said that it: “Calls upon the parties to resume negotiations under the auspices of the Secretary-General without preconditions and in good faith, taking into account the efforts made since 2006 and subsequent developments with a view to achieving a just, lasting, and mutually acceptable political solution, which will provide for the self-determination of the people of Western Sahara in the context of arrangements consistent with the principles and purposes of the Charter of the United Nations, and noting the role and responsibilities of the parties in this respect”. Therefore, we can see that the UN, through the Security Council, is attempting to pressure the parties involved to find a solution without losing more time. It is also worth noting that the renewal of the mandate of the MINURSO mission was reduced from one year to six months. It is the most striking illustration of the new UN approach. Having seen that has been ongoing in the Security Council, one can outline possible scenarios for a final resolution to the question of self-determination in Western Sahara. According to this scenario, which to some extent is an irresponsible scenario, there would be no dialogue, with the two parties standing firm on their diametrically opposing positions. Such a scenario would cement the current ethnic division and impact any future dialogue between the direct parties. Worse, it could even risk the current level of (relative) stability and inter-ethnic political communication in Western Sahara. Likewise, others argue, withdrawal from the dialogue will serve only to diminish the position of Morocco in the international arena and would probably result in sanctions by several States that recognize the SADR or by the UN, if it would begin Chapter VII enforcement procedures. Morocco would be seen internationally as an exporter of problems, rather than a promoter of stability. Scenario 2: A referendum in line with the principle of self-determination is agreed. Under this scenario, the validity of self-determination as the basis for an ongoing and definitive political settlement and agreement is confirmed. Negotiation remains the most favoured practice by the international community for the satisfaction of this principle of self-determination, which remains as a principle of international law that is imprescriptible and immutable. In addition, the referendum remains a positive model in UN practice (for example in Namibia and Timor-Leste). The virtue of this scenario process is that it would be approved by all parties to the conflict and enable the preservation of stability, social cohesion and, above all, peace at the local and regional level. Scenario 3: Economic cooperation and normalisation. The third scenario is based on economic sharing, includes the signing of a comprehensive and legally binding agreement between Morocco and the SADR that would pave the way for a genuine normalization of relations within the AU and the UN mission. Questions would arise in this scenario over issues related to education and cultural heritage. Clearly a level of integration between the Moroccan community and the Sahawari would be needed as would relations between them. But recognition at a state level is the core of the problem and if there is no mutual recognition there won’t be normalization. By far the most positive scenario is that of mutual recognition. It has been argued that the SADRmust insist on formal recognition and could gain statehood (including universal recognition and UN membership) through this process. The recognised SADR could undertake with Morocco to share natural resources and give guarantees regarding security while SADR is accepted as a fully sovereign state. It is worth noting that the list of potential scenarios can be quite extensive. For instance,in my point of view,the best option would be to choose the democratic choice, since this would be the only path that can bring hope to all of society in the Maghreb region. However, a question arises whether, with the degree of violence that constitutes the relations between Morocco and the Saharawi population, it is possible to carry out conversations without any preconditions with good faith in order to arrive at a mutually acceptable fair solution? Based on what has gone before, in order to ensure a favourable climate for both parties to win the peace, the case of Western Sahara as recognized by the UN to have the right to self-determination, since the obligation not to obstruct the right to dependent peoples to self-determination is a peremptory character, must be respected. It is important though that Morocco undertakes to stop several measures that are negatively affecting Western Sahara, both as a territory and as the land of the Saharawi people. The first of these relates to the exploitation of natural resources within Western Sahara. It has previously been noted that Morocco lacks the capacity to dispose of the natural resources of Western Sahara. However, Morocco has engaged to exploit the resources of the area with the conivence of foreign powers. Indeed, the EU has been moving to sign a trade agreement on fisheries and agriculture that includes Western Sahara with no respect for the decision of the European Court of Justice, which had ruled on this issue in a clear manner when it stated that only the Saharawi people have the right to decide the fate of their natural resources and not Morocco in its place. Further, the transfer of Moroccan settlers to Western Sahara is to be regarded as an element of Morocco colonizing Western Sahara and changing its demographic composition. The Moroccan policy of building settlements in the occupied territory has no legal validity. If both of these elements continue, the negotiations on the future of Western Sahara will know the same fate as before: a cul-de-sac. Ali El Aallaoui is an analyst, writer, researcher in geopolitics and anthropology based in El Aaiun Western Sahara controlled by Morocco. He is currently An Administrative Officer in a Social Security Office and working as freelance trying to understand the problematic of negotiations in UN peacekeeping missions mainly in North and West Africa. Western Sahara is that portion of the desert, whose limits result from the division of West Africa between French and Spanish (Berlin Conference, 1884–1885), located between Morocco and Mauritania along the Atlantic coast (land266,060 km², Coastline: 1,110 km). In August 5, 1979, Mauritania signed a peace agreement with the Polisario and withdrew from Oued Eddahab, the south part of Western Sahara, and in 1984 Mauritania recognized the Sahrawi Arab Democratic Republic (SADR). The Berm separates the Moroccan controlled areas (80%) to its west and the SADR controlled area (20%) to the east. Stein Tonnesson, National divisions in Indochina’s decolonization, in Decolonization Perspectives from now and then Edited by Prasenjit Duara, Routledge, London,2004 p.253. The Madrid Agreement between Spain, Morocco and Mauritania was to end the Spanish presence in Western Sahara, its main clause being “to divide the territory between Morocco and Mauritania while Spain maintain some economic interest in phosphates and fish”. This agreement was in conflict with the law on decolonization of Western Sahara. The Polisario Front, “Popular Front for the Liberation of SaguiaEl Hamra and Rio De Oro”. The SADRwas proclaimed by the Polisario Front on February 27, 1976 in Bir Lehlou Western Sahara. The United Nations Mission for the Referendum in Western Sahara (MINURSO) mission was to monitor the cease-fire and to organize and conduct a referendum in accordance with the Initial Settlement Plan. In 1965, there was the first UN resolution in favour of the self-determination of Western Sahara through a referendum of the populations concerned. General Assembly, A/Res/20/2072 1965 (16.12.65). In June 1966, at a meeting of the “committee of 24”, Morocco called for the independence of Western Sahara. General Assembly, A//RES/35/19 in 1980 (11.11.80). S/RES/1292 (2000) of February 29, 2000. In a somewhat comparable case, that of the North Sea Continental Shelf, the ICJ concluded there is an obligation on states to enter “into negotiations with a view to arriving at an agreement… they are under obligation so to conduct themselves that the negotiations are meaningful…” The ICJ Case of the Continental Shelf of the North Sea Judgment of 20 February 1969. UN Colonial Declaration GA Resolution 1541(1960) provide, the right of self-determination for colonised peoples in non-self-governing territories can be exercise by (a) the achievement of independent statehood (b) by integrating with another territory (e.g. a neighbouring territory); or (c) by deciding to associate with an established State (usually the previous colonial authority). In 1965 the General Assembly adopted its first resolution on Western Sahara requesting Spain to decolonize the territory. Jus Cogens refers to norms of international law that have peremptory force, which are binding and from which no derogation may be made except by other peremptory rule. The only definition of Jus Cogens is that provided in arts. 53 and 64 of the Vienna Convention on the law of Treaties 1969. On May 23, 2003 James Baker as special envoy to Western Sahara presented a peace Plan for self-determination of the People of the Western Sahara or simply as Baker Plan II. For example, the Resolutions of the Security Council, S/RES/1598, 2005. Article 23 of the final draft of the International Law Commission on the Law of Treaties provides: “Every treaty in force is binding on the parties and shall be enforced by them. Sincerity. Doc. A / 6309 / Rev. 1, p. 14. Resolution 2414 (2018) Adopted by the Security Council at its 8246 the meeting, on 27 April 2018. See the letter date 29 January 2002 by the Under Secretary General for Legal Affairs, Mr Hans Corell addressed to the President of the Security Council, UN DC’s/2002/161. In its ruling, the ECJ 27 February 2018(European Court of Justice) stated that the EU-Morocco pact “is valid in so far as it is not applicable to Western Sahara and to its adjacent waters. If the territory of Western Sahara were to be included within the scope of the fisheries agreement that would be contrary to certain rules of general international law”. The universally ratified 1949 Geneva Convention IV Relative to the protection of civilian persons in time of war includes a set of provisions on the obligations and rights of the occupying power in an alien territory. Article 49 stipulates that the occupying power shall not deport or transfer parts of its own civilian population into the territory it occupies, nor shall it deport or transfers parts of the indigenous population of the territory away from that territory.